Octogenarian senior citizen and in 2016 still the lead singer of the 1960's American group The Four Seasons, Frankie Valli (Francesco Castellucio) was born on May 3, 1934 in Newark, New Jersey. Frankie grew up in New Jersey and is known for his Jersey roots and his three-and-a-half-octave range (baritone to falsetto soprano). "I was always standing on the corner near our apartment singing harmony with friends. We'd also go to the park and sing under the bridge near the lake for the echo. When it was cold out, we'd stand in the little heated lobby in the project's administration building, where my mom paid the rent each month... At school, I'd sing in groups in the locker room or in the bathroom, which was like an echo chamber." Frankie Valli's friends growing up included Tommy DeVito and Nick Massi, both of whom did jail time for small robberies. He has said of living in New Jersey (home of The Sopranos and a city widely known for deep Mafia roots), that "If you didn’t watch out you could wind up in the trunk of a car.” In interviews with People and the Huffington Post, Valli has said that as a youth he was arrested for breaking and entering, and was on probation for five years. Another friend in their New Jersey neighbourhood was child actor Joe Pesci, younger than both Tommy and Frankie, but like them, a music lover. Tommy Devito invited Frankie Valli to sing with his Variety Trio group in the early 1950's; the Variety Trio had broken up by 1953. That year, local New Jersey country singer "Texas"Jean Valley heard Frankie sing and introduced him to a music publisher; his eventual last name change to Valli was in honour of Jean Valley. Frankie Valli's first solo single, My Mother's Eyes (1953), went nowhere. Before his name change to Valli, Frankie Castellucio married a young mother of one (toddler Celia), Mary Mandel (nee Mondelli) in the mid-1950's. He worked at odd day jobs and sang nights in small New Jersey clubs to support his family. Mary and Frankie Valli had 2 more daughters - Antonia (b. 1958/59), and Francine, born in 1960. By 1956 Frankie had teamed up again with friend Tommy DeVito, his brother Nick, and Hank Majewski, to form The Four Lovers. The group released several singles between 1956-1958, only one of which made the charts - You're The Apple of My Eye (1956) landed at #62 on the Billboard US Hot 100. Nick DeVito and Hank left The Four Lovers in 1958 and were replaced by Nick Massi (Macioci) and Hugh Garrity. In 1959, Tommy and Frankie Valli's friend Joe Pesci introduced The Four Lovers to singer-songwriter and piano player Bob Gaudio, who joined the group along with Nick Massi. The Four Lovers began working with songwriter and producer Bob Crewe and sang backup for other artists on recordings. After seeing the sign for a New Jersey bowling alley/cocktail lounge in 1960, The Four Lovers were inspired to change the name of the group to The Four Seasons. The Four Seasons breakout hit came in August 1962 when the single Sherry (written by Bob Gaudio) was released and went to #1 on the US Hot 100 charts,. The world was now aware of Frankie Valli's amazing falsetto voice. Below, audio performance of the original Franki Valli and the Four Seasons, singing Sherry. The chart success of Sherry was quickly followed two months later by Big Girls Don't Cry, written by Bob Gaudio and Bob Crewe, also a #1 hit single in 1962. Baby boomers may remember hearing Big Girls Don't Cry play in the background on different episodes of the television series Happy Days set in the 1950's, and in the hit move Dirty Dancing (1987). Below, Frankie Valli and The Four Seasons performing Big Girls Don't Cry live on television in 1964. 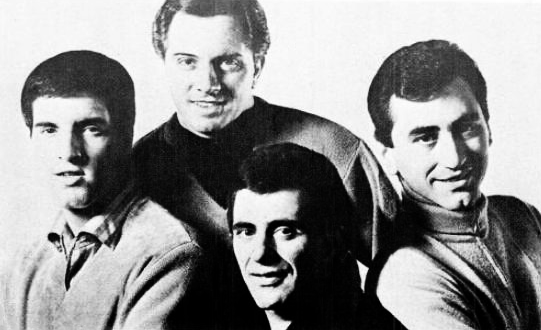 By the end of 1964, The Four Seasons had become "The Four Seasons (or, The 4 Seasons), featuring Frankie Valli"; Valli was also working with Gaudio and Crewe on solo recordings. Between 1964-1967, The 4 Seasons featuring Frankie Valli had 10 songs in the Top Ten charts. Below, Frankie Valli in front with The Four Seasons behind, in 1966 - from left, Bob Gaudio, Tommy DeVito, and Joe Long (Joseph LaBracio), who replaced Nick Massi from the original Four Seasons line-up. Rag Doll (1964) written by Bob Crewe and Bob Gaudio, was released in June 1964 and was their fourth #1 hit single. Below, Franki Valli and the 4 Seasons sing Rag Doll. C'Mon Marianne (1967) written by L. Russel Brown and Raymond Bloodworth, was the last Top Ten hit in the 1960's for The 4 Seasons featuring Frankie Valli - reaching #9 after it's June 1967 release. That same year, Frankie Valli's first solo single to reach the Top Ten was Can't Take My Eyes Off Of You (1967), written by Bob Gaudio and released in April 1967. Can't Take My Eyes Off Of You was a #2 hit single for Valli, and has been covered by numerous artists such as Engelbert Humperdinck, Barry Manilow, The Killers, and others in the decades since then. Below, Frankie Valli sings Can't Take My Eyes Off Of You. By the end of the 1960's Frankie Valli had become friends with his childhood idol Frank Sinatra (and his daughter Nancy Sinatra). It was Frank Sinatra that showed Valli exercises to protect his voice after Valli underwent vocal cord surgery in the late 1960's. Valli had also begun to have hearing problems in 1967 due to a middle ear bone problem (ostosclerosis) in both ears. He underwent two unsuccessful surgeries until in 1978 a new ear surgery to replace parts in both ears restored his hearing to almost normal levels. In a 1967 interview (below), Frankie Valli praised the songwriting and creative genius of The Four Seasons member Bob Gaudio, and talked about his love of performing. During this time Frankie Valli went through a divorce in 1971 from first wife Mary (Mary Valli died in April 2007). The Four Seasons and Valli continued to record, and although their chart success was fading, their live performances were in demand. Drummer Gerry Polci joined The Four Seasons for the first time in March 1973 (he would leave and return a couple of more times). Frankie Valli had met model Mary Ann Hannagan (sometimes spelled Hannigan) when his first marriage was breaking up; Mary Ann and Frankie Vallie were married in June 1974. In 1975, Franki Valli and The Four Seasons accumulated 3 Top Ten hits, between solo recordings and group records, including December, 1963 (Oh, What a Night) (1975) which was another #1 for The Four Seasons. Drummer Gerry Polci sand lead vocals on the song. A remix dance version of December, 1963 (Oh, What a Night) in 1994, went to #14. It was the last Top Ten hit for The Four Seasons, although the group is still together and performing. The original composition of The Four Seasons broke up in 1977, but Valli remained as lead singer and other members came and went. As the 1980's began and his records began to drop down the charts, Frankie Valli was devastated when his step-daughter Celia Shelleck was killed in an accident in February, followed only 6 months later by youngest daughter Francine Valli's death in August 1980 at the age of 20, from an accidental drug overdose. By 1984 Frankie Valli's marriage to Mary Ann had ended in divorce in 1982 after eight years together, and Valli (entering in his 50+ years) married for the third time in July 1984, to 24-year-old Randy Clohessy. Randy and Frankie Valli had 3 sons together - Francesco (b. 1987) and twins Emilio and Brando (b. 1994), before separating in 2004 after 20 years together. Divorce proceedings have dragged on for years. 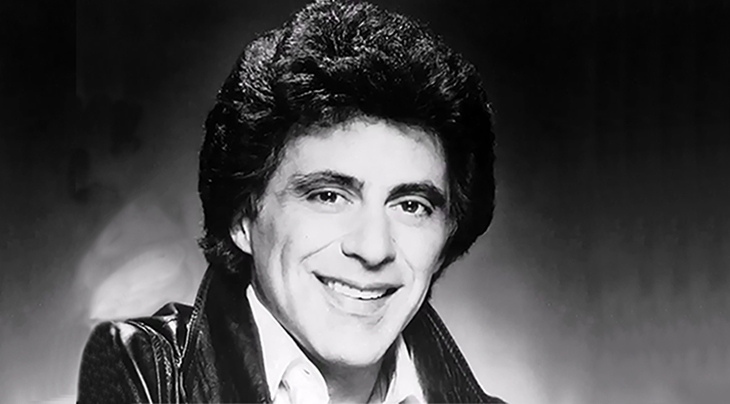 Frankie Valli began to do small acting parts on television series during the 1980's and his 50+ years, including the baby boomer favorite show Miami Vice in 1985. He enjoyed a guest-starring bit as himself in the DJ's Choice episode of Full House (1995) with his 7-year-old son Francesco Valli; and was in the movie Witness to the Mob (1998). In 1990 Frankie Valli, Bob Gaudio, Nicki Massi and Tommy DeVito entered both the Vocal Group Hall of Fame and the Rock & Roll Hall of Fame. Drummer/vocalist Gerry Polci left The Four Seasons for the last time and married Frankie's divorced daughter Antonia (Toni) Farano (nee Valli) in 1991; the couple made Valli a grandfather twice over by 1994 (Olivia and Dario Polci) before divorcing. In December 2000, the year after Frankie Valli became an official senior citizen, 73-year-old septuagenarian Nick Massi died. By 2004, Frankie Valli was a septuagenarian senior citizen himself and had began appearing as a mob guy Rusty Millio occasionally on the television series The Sopranos. The Sopranos often featured songs by Frankie Valli and The Four Seasons, and even had an episode titled Big Girls Don't Cry (2000). In 2005 the story and music of The Four Seasons and Franki Valli was presented for the first time in the Broadway musical Jersey Boys, which became a smash hit. The musical was later adapted for the Jersey Boys movie (2014), directed and produced by Clint Eastwood. Septuagenarian senior citizen Franki Valli made his own Broadway debut with a 2012 concert. Valli was recognized for his long-standing support of Italian heritage causes when he received the National Italian American Foundation (NIAF) Lifetime Achievement Award in 2006. Below, Frankie Valli is embraced by then-President George W. Bush after a performance of Jersey Boys at the White House. Upon becoming an octogenarian senior citizen in 2014, Frankie Valli appeared in the movie And So It Goes (2014) and had a role as Carol Burnett's fiancee in an episode of Hawaii Five-0. Today, 82-year-old Valli has homes in Los Angeles and New York, and continues to perform solo and with The Four Seasons - 55+ years after the group first took the name in 1959. You can see Franki Valli in concert in Canada and the United States throughout 2016. Happy 82nd Birthday, Frankie Valli! June 12, 2016 to correct date of entry into Rock & Roll Hall of Fame from 1999 to 1990. May 2, 2018 with new images & videos. ABSOLUTELY AWESOME, I TOTALLY LOVE FRANKIE VALLI. ?? Thanks for catching that! We've corrected it now. The Four Seasons were inducted into the Rock and Roll Hall of Fame in 1990, not 1999. Thanks for the great article 'biography' on Frankie Valli. I have followed the 4 seasons from their 1st hit. Then after graduating high school I left New Jersey for So. California in Jan of 1963 and was your biggest fan out here..